Airbus A319 operated by Spirit Airlines offers 145 seats of economy class. For food and drinks offered on board Spirit Airlines accepts only credit cards and no cash. This airplane offers economy class systems of two types: big front and deluxe leather. 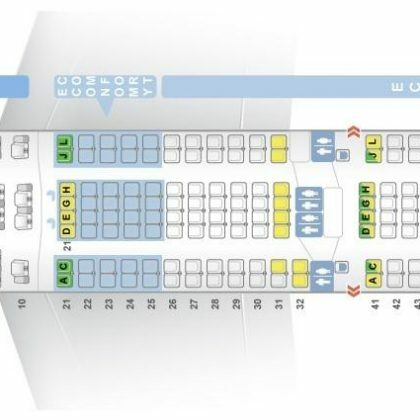 There are 10 seats of big front class. These seats are located in the first 2 rows that have 2-2 configuration and 2 seats are located in the 3rd row. Big front seats have pitch of 36 inches and the width of 20 inches. The seats of the 1st row have the following disadvantages: lack of floor storage during take-off and landing, noise from the lavatories and galleys located in front and slightly reduced width because the tray tables are in the armrests making them immovable. The other 135 seats are deluxe leather seats. All these seats are not reclining and are located in two sections. Deluxe leather seats have the smallest pitch among all domestic US carriers – 28 inches. The seats 4ABC and 5DEF are narrower than standard as the tray tables are built-in the armrests. Behind the exit row the second section of deluxe leather type are located. This section contains 16 rows of seats that have 3-3 configuration. Passengers of the seats of the 11th row will take advantage of extra legroom. However, these seats have reduced width and have no floor storage during take-off and landing. 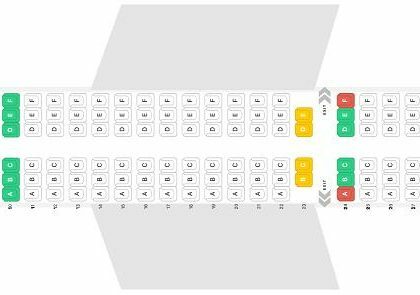 The seats of the last 26th row are considered bad seats because of the galley and lavatory located behind and passengers of these seats will be among the last to deplane upon arrival.